When I was at the Y the other day doing my elliptical workout, I glanced up at the TV. Some daytime kids show was on. In it, a cartoon child and his animal friends, all wearing fake mustaches, like you do, were climbing a fence. An adult came over and pointed at a sign that had fallen on the ground saying not to climb on the fence. “Ah,” I thought to myself, “this is one of those follow the rules lessons.” But then (according to the closed captioning) she said to them, “Why don’t we climb fences?” The child, now standing on the ground and looking chastised, replied, “Because we could fall and get hurt.” I almost fell off the elliptical. “Seriously?” I said out loud. A few people around me looked at me and I smiled and went back to staring at my heart rate, distance, speed, and calorie burn. 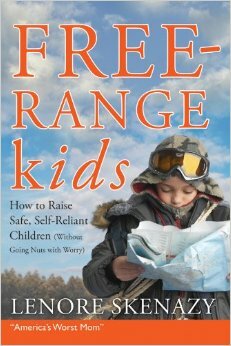 Lenore Skenazy’s “Free Range Kids, How to Raise Self-Reliant Children (Without Going Nuts with Worry)” (non-affiliate link) grew out of an article she wrote about when 9 year old son asked her if he could go home by himself. They lived in Manhattan and were downtown at a Macy’s. He wanted to take the subway home by himself. He’d done it with her a hundred times, knew how to do it. She let him. And you know what happened? He got home just fine. She then wrote about it for a New York magazine and subsequently got savaged by the press, by other parents, by virtually everyone around her. “How could she be so irresponsible?” She did the morning talk show circuit, usually being paired with one or another “expert” in raising children, who schooled her on how awful she was. And yet, she wasn’t. Not at all. Over the last few decades (or longer) we have bubble wrapped our children. We’ve locked them inside in the misguided notion that if we never let them do anything, they can never get hurt. But life happens and we are far better off giving them the tools they need to survive in the world. That means taking risks and letting them learn by doing. Sometimes they fall, and sometimes they get hurt. But that’s how we all grow. It’s how we learn. And, really, what exactly are the risks? This is where her book gets really interesting. She goes into the various risks that are out there. For example, the risk of dangerous pedophiles and/or kidnappers? Actually less than when my generation were kids. And kids (and potential witnesses) all have cell phones now. And, anyway, the vast majority of molestation cases are caused by relatives or close friends of the family. Nothing parents are doing are preventing those. If anything, not educating their children about such things makes it more likely to happen. Skenazy talks about other common fears and debunks them just as thoroughly. Hallowe’en candy? Not one single recorded case in over 60 years of any child being hurt by something done to the candy they were given. Exploring the woods out back? A place of magic and discovery, not one of lurking villains. You get the idea. These chapters are then followed by an A-Z list of things to worry about that are similarly debunked. To be clear, she is not advocating abandoning common sense. If anything, this is a manifesto for common sense. Children are 40 times more likely to die in a car accident than at the hands of a murderer, so wear seat belts! Crashing on a bike is common. Wear a helmet. She advocates for intelligent precautions, not paranoia and irrational fear, which is far more prevalent today. The one place where I fault the book at all is in the writing style. She uses a glib humor to make her points. Often it works but just as often, it comes across as overly snarky or judgmental. I listened to the audio-book version and I don’t think it helped that the reader, Susan Bennett, really played up the sarcasm and snark, possibly over emphasizing the book as-written. Aside from that, the book is spot on and an absolutely necessary read. It makes a great double-header with danah boyd’s, “It’s Complicated,” reviewed previously. My son recently had a birthday party at our home. He invited a bunch of friends, some from school, some from our community theater. One of the guests, a teenaged girl of 16, drove herself to the party from about 15 minutes away. When she arrived, I overheard her on the phone for over ten minutes calming her panicked parents down because she was at some stranger’s house. She calmed one parent down and then was given to the other and had the same calming conversation again. They were so worried about where she was, who she was with. What was interesting to me was that they never asked to speak to either me or my wife. Instead, she spent all that time talking them in off the ledge about this strange place she’d come to. When she got off the phone, I suggested she buy her parents a copy of Free Range Kids to read.